February 2011 – Teach It! Tech It! Learn It! Lead It! Today is the official launch of EdReach.us, the educational media network, a collaboration by educators from all over the United States. Do we really need another Educational blog? There are so many others out there- aren’t there enough? Well, that is true, there are a lot of voices out there. So many voices. So many, it seems that it’s getting harder and harder to hear them, harder to cut through the volume and rate of information, harder to even keep up with well-known colleagues, and harder to be heard. EdReach.us aims to cut through this. The EdReach Educational Media Network (EdReach.us) aims to gather these voices together, and create one stream of educational news, blogs, commentary, and interactive media that highlights the innovation, highlights the ideas, highlights the cutting-edge best practices that are happening in the world’s schools every day. There is fabulous and innovative teaching happening in American education, happening all over the world- yet we forget. Lately, these moments seem to get lost under the sea of politics, budgets, and policy. Education news is also in a state of disarray. Go to most news sites and look for the education section- it’s likely you won’t find it. Still. Education isn’t getting the place it deserves in the mainstream media outlets. There are amazing new tools being used in the classroom every day- gadgets, Web tools, innovative pedagogy. There are companies that are leading the charge with innovative Web tools for teachers. There are devices that are transforming the way teachers teach, and learners learn. There are teachers that do amazing things with students every day. Every day. EdReach is made up of- not one person- but a network of educators from all over the United States- field reporters- some hosting podcasts in Connecticut, some contributing from San Diego, Missouri, Iowa, Indiana, Wisconsin, Michigan- from all over the country. And it’s expanding. So, if you want to know what’s happening in innovative Education, if you want to know what innovative education looks like, if you want to see what education can be like for America’s students and students all over the world- keep following and listening to EdReach.us. EdReach is here to tell those stories. Thanks to http://www.onextrapixel.com/ for the pic and post! Check out the fonts by going to their site. Recently I read a book review on The Truth About Leadership by Kouzes and Posner. The book review was inspiring, and convinced me that I want to read the book soon. In the review Jerry Jennings listed, from the book, five practices of exemplary leadership: model the way, inspired a shared vision, challenge the process, enable others to act, encourage the heart (p.13). I really liked this five practice list, so I decided to put my Photoshop skills to work and create a little “printable post-card sized graphic version” to hang on my office magnet board. I wanted to share this graphic printout with you; Please download the PDF, print, hang, get inspired, and share! As a district we are working on helping students create and extend meaning. One of the avenues we have used again is looking at Q-A-R. I created these posters to share with my teachers. They should be printed on 11×17 and can be downloaded on my Scribd page. John Adams was a man of honesty, wisdom, and a pursuer of liberty for the people. As Americans we can take for granted the premise of freedom on which we were founded. For the first time in their history Egyptians are pursuing their own liberty and we all watched as they took a great leap toward true freedom when their president for the past several decades, Mubarak, stepped down. What was amazing for the rest of the world to watch was how this monumental feat occurred, in no small, part through social media platforms like Twitter and Facebook. As we all learn from this point in history, how can we as educators take the lessons of the Egyptian people to help promote and preserve liberty? I would like to propose some ways educators can help students understand, create, and preserve liberty by pursuing a connected ‘general knowledge’ as described by John Adams. 1. Create a solid foundation of literacy for all students. Students must be literate citizens who know how to read, write, and pursue knowledge. 2. Teach students history from multiple perspectives using digital media to enhance the learning experience. 3. Allow students opportunities to think critically and debate across multiple platforms in multiple formats. 4. Highlight examples, as well as model for students, how social media tools can be used for good and promoting change. 5. Create school environments that are mobile-technology ‘friendly’ and allow students the use of social media. If you do not regularly read, or subscribe to, The Big Picture blog then you are missing out! This wonderful blog, published by Boston.com, weekly shares different series of inspiring photos that take you into new worlds, news, and events. PBS is airing a new documentary called “Digital Media – New Learners Of The 21st Century“, on February 13th. Check out the promo clips here and be sure to set your DVRs! Data, data, data. We are surrounded by information and data that is always at our fingertips, the problem is that we sometimes have a hard time organizing that data and using it for good. Recently I came across a website that offered some insightful data in a well organized way. The Center of American Progress recently created an amazing interactive data map. The map allows you to view your district’s rate of improvement in regards to their per pupil spending investment. The map allows you to interact with data and see how you stack up compared to neighboring districts and states. View the map HERE. In the current tumultuous financial seas our districts navigate school stakeholders are going to need to look for ways to get more bang for the taxpayer’s buck. In my opinion, districts need to start looking at implementing open source operating systems, open source software, and open educational resources. This needs to be done with true learning in mind as well as rigorous, non-shackled, evaluation for leaders and teachers. Read the rest of this post at EdReach.us. 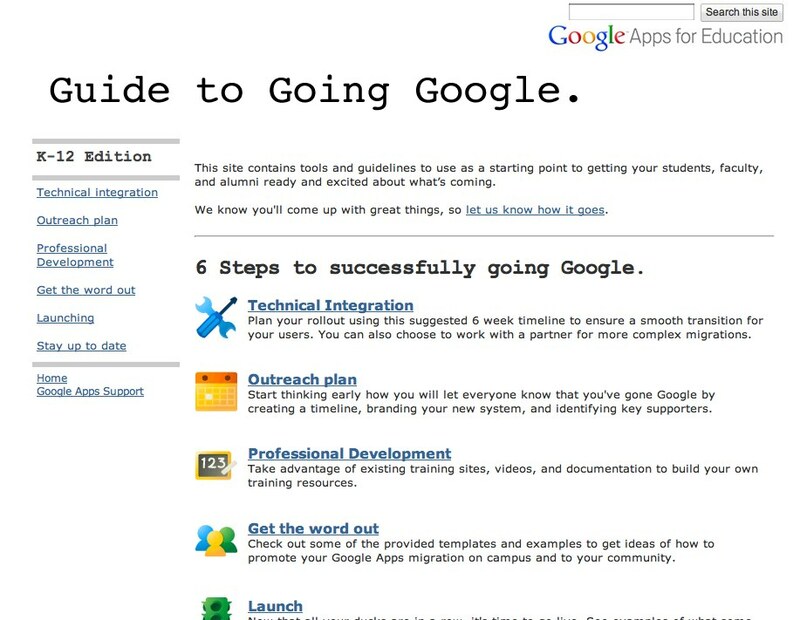 Google recently released a guide for helping your school make the transition to going Google, see the blogpost here, and the guide here.